There are other large white birds that may be confused with swans: Snow Goose, American White Pelican, and Great Egret. Sometimes a Trumpeter Swan is shot and the hunter said he thought it was a Snow Goose. It's important to know the difference! 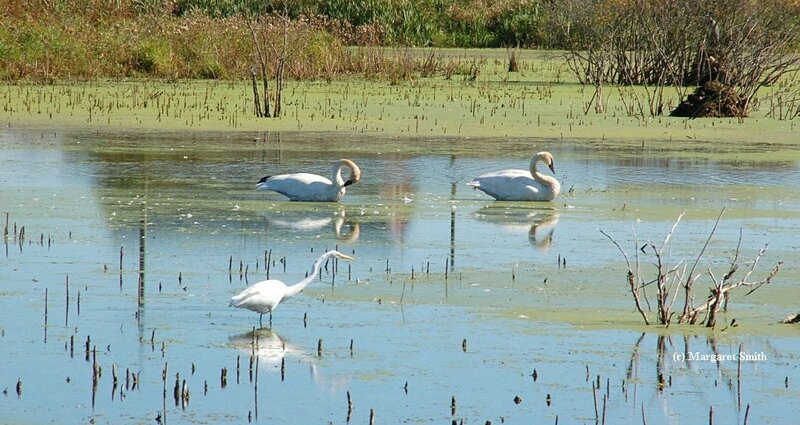 Trumpeter Swans are protected under the Migratory Bird Treaty Act. It is illegal to shoot them. 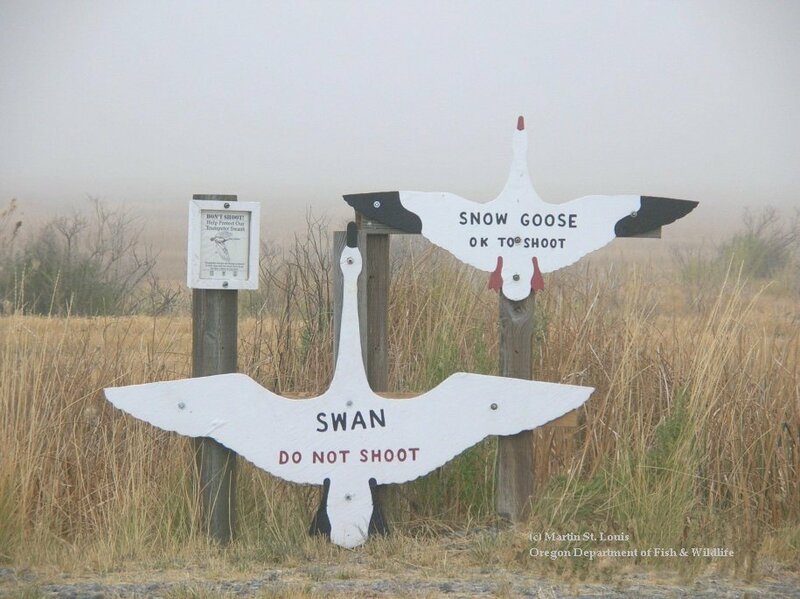 A sign for hunters at Summer Lake Wildlife Area in Oregon, to give a visual size and color identification of swans and snow geese. Photo by Martin St. Louis, Oregon Department of Fish and Wildlife. 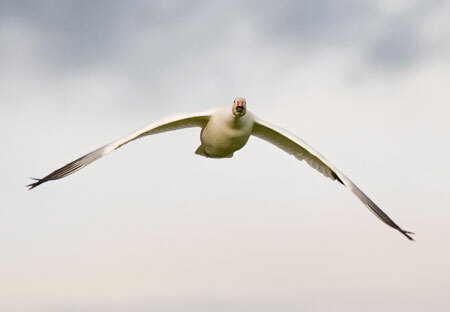 The Snow Goose is a large white bird with black wing tips on the underside of its wings. 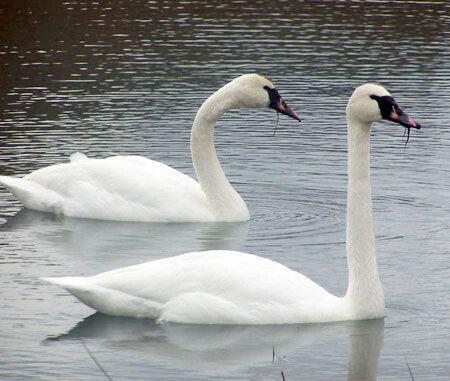 Less than one-half the size of a swan; total bill length is about 2"; bill is shorter compared to head length than in swans; bill does not extend very close to eye. The face and upper neck may be a rusty color from iron staining that occurs while feeding. Wing span about 3 feet, black wing tips, pink bill with black grinning patch on both sides of the bill, and orange legs and feet. They congregate in large flocks, often many thousands of birds. Juvenile plumage is gray with black on the wing tip area. 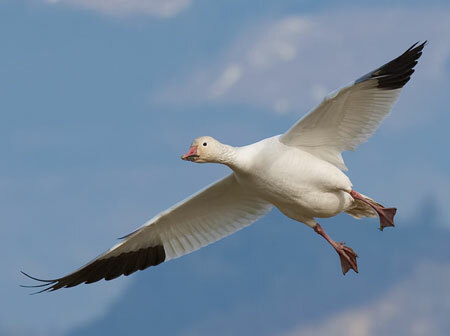 Snow Goose adult, white phase. Black wing tips, pink feet. Snow Goose juvenile - gray plumage, black starting on wing tips. An all white bird with black wing tips and a very long yellow bill. The feet are bright orange. Its wing span is about 110 inches (9 feet). It flies with its neck tucked. High in the sky, they look like they disappear, then reappear with a flash of black showing under its wings. 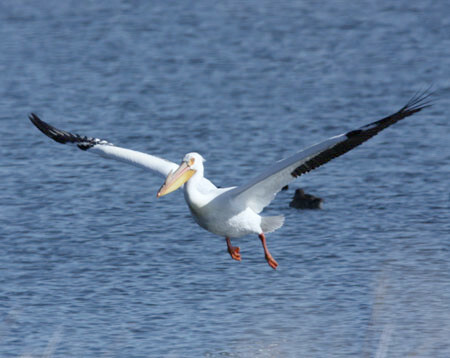 American White Pelican - black wing tips, very large yellow bill, orange feet. Tall (38 inches), thin, all white elegant bird with long pointed yellow bill. Black, stilt-like legs and feet. The Great Egret slowly stalks shallow wetlands looking for small fish to spear with its long sharp bill. Now protected, they were once hunted nearly to extinction for their long white plumage. European version of our Tundra Swan, they are considered the same species. They winter in Europe and England, breed in the eastern hemisphere high arctic. They are the same size and shape as our Tundra Swan but there is significantly more yellow on the bill, usually not going across the top of the bill. They have the same voice as the Tundra Swan. Rare visitor to west coast swan use areas. Bewick's Swan - the two center birds, adult and juvenile (neck folded back on body). Compare to Tundra Swan at back. Native to Europe and Asia, breed in the high arctic of the eastern hemisphere. 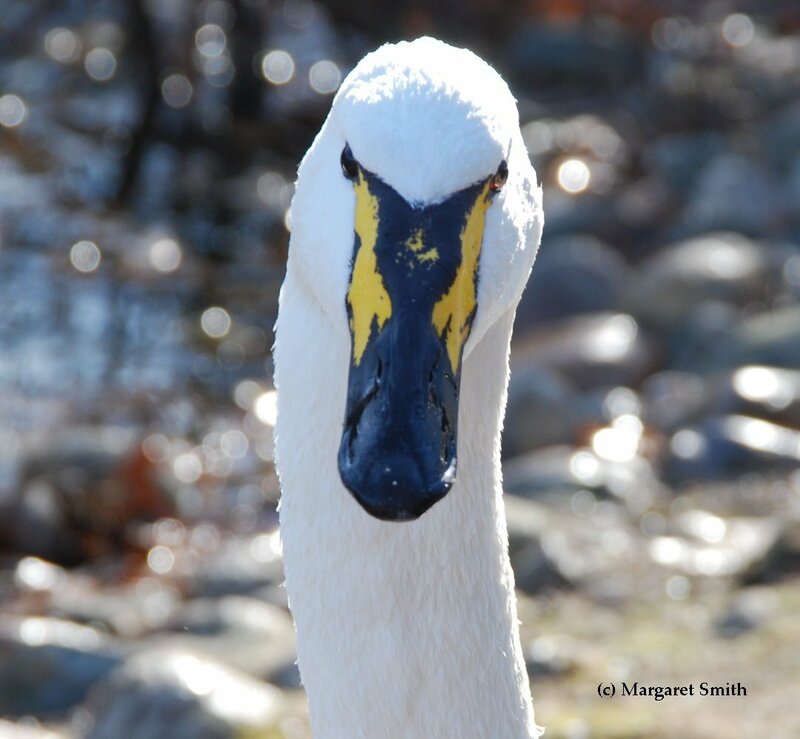 Similar to Trumpeter Swan in size and shape, but the yellow on the bill is extensive, running over the top. There is also a yellow spot under the lower bill at the base. Voice of Whooper is distinct, whooooping call. Very different from the Trumpeter Swan. Rare winter visitor to North America. Whooper Swan adult (left) - Note the Trumpeter Swan in the background right for comparison. Whooper Swan adult - Note the Trumpeter Swan in the background for comparison. 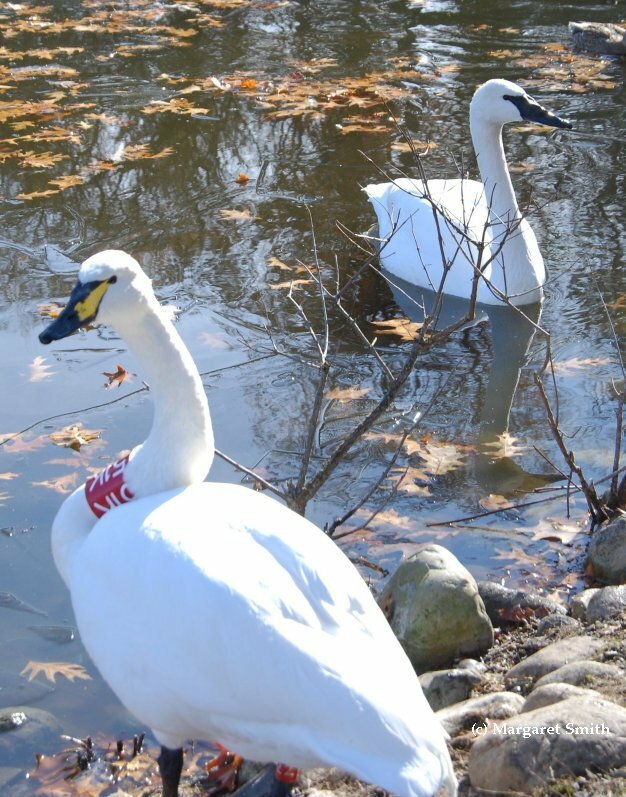 The Whooper Swan is wearing a collar put on by Kellogg Bird Sanctuary/Michigan State University to show this swan is in their swan collection. Photograph by Margaret Smith, taken at Kellogg Bird Sanctuary in Michigan. There have been rare instances where a swan of one species has paired with a swan of a different species and produced young. This has been observed in captive bred swans for a long time. In the wild it is a rare occurrence. 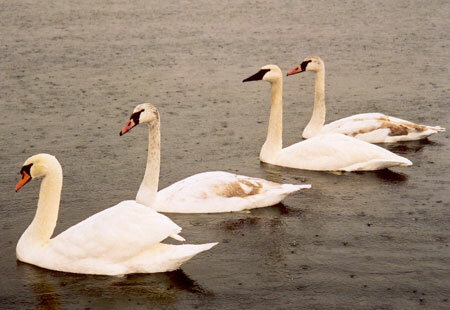 The following are photos of hybrid swans in the wild. Trumpeter Swan x Mute Swan - Vancouver, British Columbia, Canada, wild mating. Tundra Swan x Mute Swan - Kentucky area, observed in the wild. 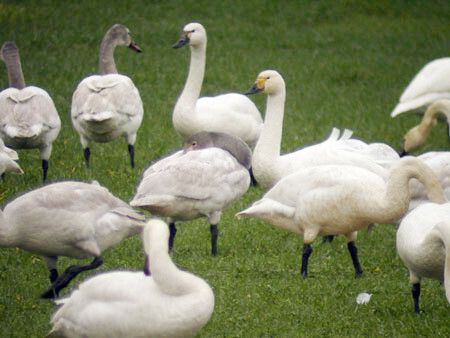 While some researchers have suggested that there are Trumpeter Swan x Tundra Swan hybrids in the wild, no documented photo of this hybrid mix is available. There are several instances of this happening in captive situations. 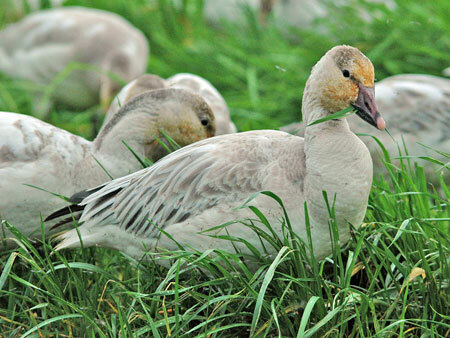 There is a wide variation with the hybridization grading from more Tundra-like to more Trumpeter-like. The call is an off note blend of both species but not like either species.